The West Virginia Highlands Conservancy is one of West Virginia’s largest and oldest conservation organizations. We have a long history of conservation success stories, but none that we are more proud of than the passage of the Wild Monongahela Act. This piece of landmark legislation was over ten years in the making and it was sponsored by West Virginia’s entire Congressional delegation. It finally passed Congress in 2009, and President Obama promptly signed it into law. This legislation protected nearly 40,000 acres of the Monongahela National Forest as Wilderness. The effort took over a decade to see success, but it only happened with the help of The Dunn Foundation. Though the financial contribution was key to sustaining the effort necessary to see a legislative campaign through to success, the moral support that The Dunn Foundation’s contributions provided was critical to the individuals working hard to make it happen. The perseverance necessary was challenging and we thank The Dunn Foundation for believing in us and providing the support we needed to achieve our goals. Places like Dolly Sods, the Cranberry and Roaring Plains are now free from the threats of exploitation and development. 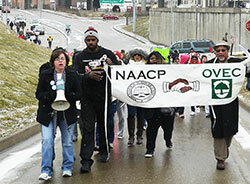 OVEC helped coordinate a press event where the NAACP released Just Energy Policies; Reducing Pollution and Creating Jobs, a West Virginia Report, focusing on state policies that can reduce harmful impacts from fossil fuel extraction and energy production while creating jobs (Photo by Vivian Stockman). “The Ohio Valley Environmental Coalition (OVEC) is very grateful to the Dunn Foundation for their years of loyal support. With their help, we have worked with residents to protect both the environment and communities from the ravages of mountaintop removal coal mining and its associated problems. The forests of Appalachia are some of the most bio-diverse ecosystems in the world, yet this destructive type of mining has already wiped out an area larger than the state of Delaware. 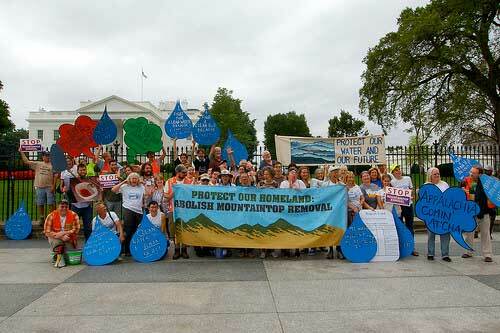 Entire tops of mountains are blown off and dumped into nearby valleys, burying and polluting headwater streams. In neighboring communities, drinking water is often contaminated and residents experience blasting damage and devaluation of homes, dust, flooding, and sludge impoundment leaks/failures. Peer-reviewed research shows that people living near mountaintop removal sites have significantly higher rates of health problems and early death, along with shocking rates of birth defects. Many nearby communities have become ghost towns as people move away. With help from hundreds of affected residents and other volunteers, our wins include a temporary moratorium on new underground sludge injection (still in place), and municipal water for residents of several communities where water wells are polluted from toxic sludge. In 2012, residents of Cedar Creek contacted OVEC after a rash of cancer cases in their community made them suspect their water was contaminated by coal-related pollution. OVEC raised money for water testing that revealed elevated levels of contaminates; we then connected residents with lawyers. 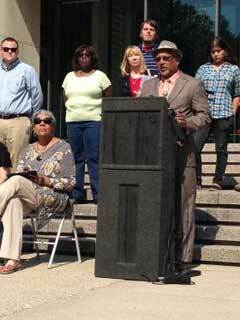 Recently, a judge ordered the company to provide replacement water for 16 homes. One Cedar Creek resident had this to say: “If my son hadn’t happened to see that OVEC flyer on the (Marshall University) campus, we wouldn’t be here today.” We are currently working with the Kanawha State Forest Coalition to challenge a mountaintop removal permit that allows blasting within 588 feet of the Kanawha State Forest and restricts public access to roads and trails for the next ten years. In January 2014, when the water supply of more than 300,000 people was contaminated by a coal-related chemical leak, OVEC helped form the WV Clean Water Hub to deliver water and other needed supplies. We also connected affected residents with journalists to garner nationwide exposure, and helped organize rallies and meetings where citizens could hold politicians and regulators accountable. In response to citizen outcry, the legislature passed Senate Bill 373, which imposes the first-ever regulation of above-ground storage tanks. OVEC also works with a team of pro-bono lawyers to require coal companies to clean up illegal stream pollution. In 2012, Patriot Coal announced it would phase out its mountaintop removal operations in Appalachia; this decision ensued from legal victories by OVEC and its partners that forced the company to spend hundreds of millions of dollars to clean up toxic selenium in streams. Our lawyers have argued that fines resulting from our legal victories should benefit the communities that have been harmed. Over the past few years, the West Virginia Land Trust has received more than $10 million from these settlements to preserve important riparian land in southern WV; a total of 1.8 million will go toward sustainable economic development in West Virginia. A new non-profit will use the funding to support and promote ventures such as sustainable farming and renewable energy projects, as well as water and stream protection/restoration projects. 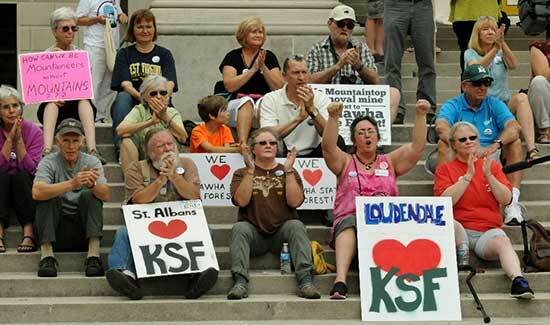 Residents rally on the steps of the Capitol to demand that Governor Earl Ray Tomlin protect the Kanawha State Forest and surrounding communities from the adverse effects of mountaintop removal. They delivered a petition signed by several thousand people asking that a permit allowing blasting within 588 feet of the State Forest be rescinded (Photo by Vivian Stockman). OVEC staff and volunteers participate in the Alliance for Appalachia’s “Our Water, Our Future” event in Washington, DC (Photo courtesy of the Alliance for Appalachia). The West Virginia Wilderness Coalition is leading a citizen effort to protect a special part of the Monongahela National Forest as the Birthplace of Rivers National Monument. This special wild area, in and around the Cranberry Wilderness Area, would be permanently preserved for future generations to explore and enjoy. As its name suggests, the Birthplace of Rivers area is home to a uniquely high number of headwaters. In fact, headwaters and tributaries of the Cranberry, Cherry, Gauley, Elk, Greenbrier and Williams Rivers begin within the proposed monument. Without stronger protection, these cherished resources could be threatened by potential industrial development. Backed by a true coalition of local and statewide partners, the Birthplace of Rivers National Monument initiative enjoys broad support from several local elected bodies, recreation groups, economic development organizations and over 200 businesses. West Virginia is proud of its role as a headwaters state, and a national monument would give this special piece of 'Wild and Wonderful' the protection and recognition it deserves.